If you take time to observe the sky, you will be amazed to discover different cloud forms. But aside from being nice features in the sky, clouds play a role in knowing the intensity and severity of a weather system. One of these unique but helpful cloud formations are roll clouds. These clouds are rarely seen which is why they are very highly regarded by photographers and cloud spotters. As the name suggests, roll clouds are clouds that appear to roll horizontally and are completely separated from the base thunderstorm cloud. It is often seen rolling ahead of the gust front or cold front of a thunderstorm. Although it may look like a horizontal tornado, roll clouds never produce tornadoes. Rather, they are a strong indication of microburst activity, or the process of rapidly descending cold air from the thunderstorm. How do Roll Clouds Look Like? As mentioned earlier, these amazing cloud phenomenon look like horizontal tornadoes. They appear like long tubes rolling in the atmosphere without changing shape or speed. Roll clouds appear to be rolling on a horizontal axis, exists by itself and not attached to any other cloud form. At What Altitude is Roll Clouds Found? This type of cloud develops at low cloud levels; hence, you can find them at elevations just about 6,000 feet above the Earth’s surface. Although it often appears ahead of a thunderstorm’s gust front, it may also be created from a dissipating thunderstorm whose downdraft spreads out and lifts warm, humid air that was still present on the surface. How does a Roll Cloud Form? Roll clouds form due to the condensation of moisture in the low cloud level. It occurs as a result of rapidly sinking cool air from thunderstorm’s downdraft. As the cool air sinks, it expands throughout the surface with a gust front. The outflow of cool air into the surface prevents warm and moist air from being pulled into the rising thunderstorm updraft. Wind shear at the lower cloud level causes the cloud to roll about a horizontal axis. There is only one type of roll cloud and it is very popular in Australia- the Morning Glory Cloud. This cloud is a very long roll cloud that stretches over 500 miles in the atmosphere. What makes this cloud remarkable is that it only rarely occurs in other parts of the globe but frequently crops up in the Gulf of Carpentaria in Australia. 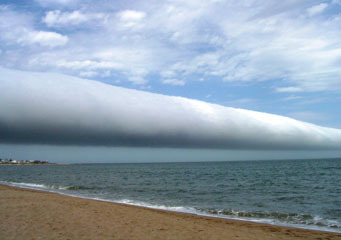 This type of roll cloud develops due to mesoscale circulation coupled with the gentle sea breeze that develops over the Gulf of Carpentaria and Cape York Peninsula. Nevertheless, Morning Glory Cloud may also form due to thunderstorm downdraft. How common are Roll Clouds? Though quite rare, there have been sightings of roll clouds in coastal areas such as in California in the United States, Ontario and Nova Scotia in Canada, Easter Russia, Sea of Cortex in Mexico and Australia. Roll clouds hardly ever appear in the sky, so if you do see them, it can be a very memorable sight of an advancing thunderstorm.